Follow this quick tip and learn how to draw a shiny abstract background. Using the basic shape tools and some gradients, you will be able to create nice looking vector backgrounds. In addition, we’ll take a look at the basics of Illustrator’s new pattern creation tools and get started using it. Let’s check out how it works! 1. Open up a new document and set the dimensions of the Artboard to 700 x 420px. First, grab the Rectangle Tool (M) from the Tools Panel and create a rectangle with the same dimensions as the Artboard. Open up the Gradient Panel and fill the resulting shape with radial gradients as shown below: dark slate grey (R=54, G=57, B=66) and black (R=15, G=18, B=27). 2. It’s time to create our first custom pattern. Using the Ellipse Tool (L) create a black ellipse and set the dimensions to about 6.5 x 6.5px. Create another ellipse, but scale it down a bit. Then, move this newly created shape into the position as shown below. Duplicate the objects and send them to the back using the Send Backward (Ctrl+[) command. Nudge the objects down a bit in small increments, say 0.1 pixel at a time. Open up the Color Panel and change the fill of the objects to medium grey (R=105, G=114, B=127). 3. Select all ellipses, and choose Object > Pattern > Make and the warning screen will appear. Once you click OK to close notification message, Illustrator takes you into the Pattern Editing Mode. First, go to Window > Pattern Options to activate the control panel that allows much more control over both existing and custom patterns. When the Pattern Options box appears, give the pattern a name, in this case “Dot Pattern”. You can follow the directions given below, but you can also choose a lot of other options there. Once you are happy with the result, just click Done at the top left of the screen, and you are back in normal mode. If you decide you want to make some further adjustments, just double click our new pattern from the Swatches panel. Now make a copy of the rectangle we have created in Step 1 and place it just above the previous one. Pick the pattern from the Swatches Panel and apply it to the selected object. 4. Make another copy of the rectangle and make sure you place it above everything else. While the object is still selected, fill the resulting shape with radial gradients as shown below: light grey (R=230, G=230, B=230) and dark grey (R=51, G=51, B=51). Open up the Transparency Panel and change the Blending Mode to Multiply (Opacity 100%). 5. 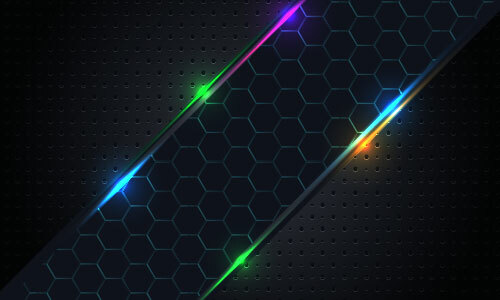 Let’s create another background element. Grab the Rectangle Tool (M) and draw a rectangle, whose dimensions should be set to about 850 x 225px. Open up the Color Panel and set the fill color to black (R=15, G=18, B=27). Keep the shape selected, and go to Object > Transform > Scale… to bring up a new dialog box. Instead of ‘Uniform’, click ‘Non-Uniform’ and type in 100% for the Horizontal scale and 86% for the Vertical scale. Once done, check ‘Transform Objects’ in the Options section and hit Copy. By using the Transform Again (Ctrl+D) command, you can quickly repeat the last transformation on the selected object. Now we have 3 different sized rectangles placed one above the other. Select the second object in the stacking order and fill the selected object with radial gradients as follows: dark slate grey (R=54, G=57, B=66) and black (R=15, G=18, B=27). Finally, leave the third rectangle (object on top) unchanged. 6. Make a copy of the third rectangle from the previous step and keep it for later. 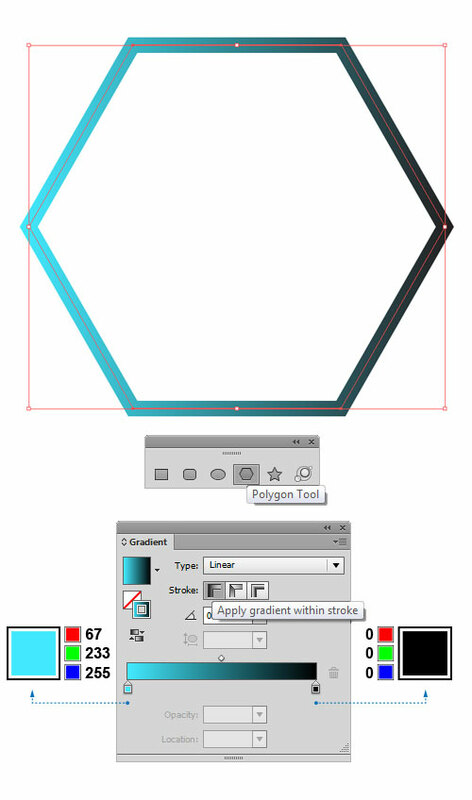 Pick the Polygon Tool, which can be found in the fly-out menu of the Rectangle Tool (M), and create a hexagon (refer to the image). Set the dimensions of the object to about 40 x 35px. Do not fill the shape, but apply only a stroke to it. Stroke Weight should be set to about 1.5pt. 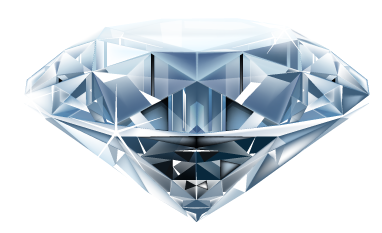 In Adobe Illustrator CS6, we have the ability to apply gradients directly to the strokes. So, keep the object selected and apply the gradient within the stroke by clicking first option in the Gradient panel. Now fill the resulting shape with linear gradients: turquoise (R=67, G=233, B=255) and black (R=0, G=0, B=0). 7. Once done, select Object > Pattern > Make to open the Pattern Editing Mode. When the Pattern Options Panel appears, give our new pattern a name, let’s say “Hexagon Pattern”. Make sure you have entered the values as shown in the figure below. When you are satisfied with your settings, click Done at the top left of the screen to confirm. Bring out the copy of the rectangle we have made earlier and place it exactly above the previous one. Now apply the pattern to the rectangle’s fill by selecting the rectangle and clicking on the pattern in the Swatches Palette. Open up the Transparency Panel and change the Blending Mode to Screen (Opacity 30%). 8. Pick the Ellipse Tool (L) and draw a long thin, horizontal ellipse whose dimensions should be set to about 660 x 7px. Activate the Gradient Panel and fill the resulting shape with radial gradients: green (R=63, G=255, B=107) and black (R=0, G=0, B=0). In the Transparency Panel change the Blending Mode to Color Dodge (Opacity 100%). Once done, make several copies of the objects and arrange them all over the edges of the hexagon pattern we have created earlier, as shown below. 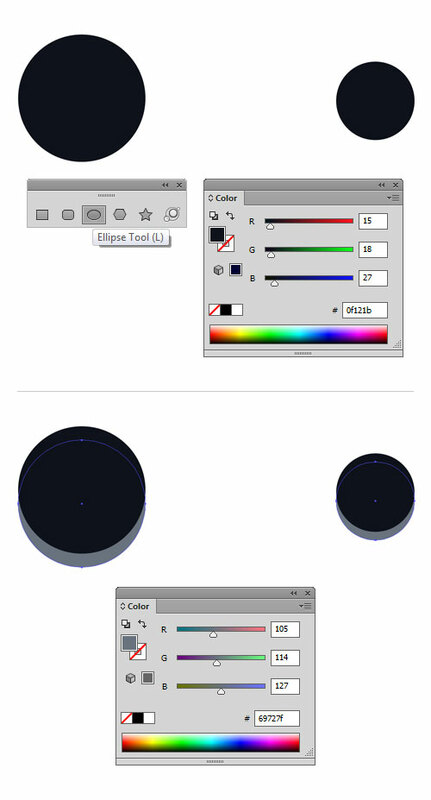 To make it more interesting, you can choose different gradient fill for each of the objects. 9. 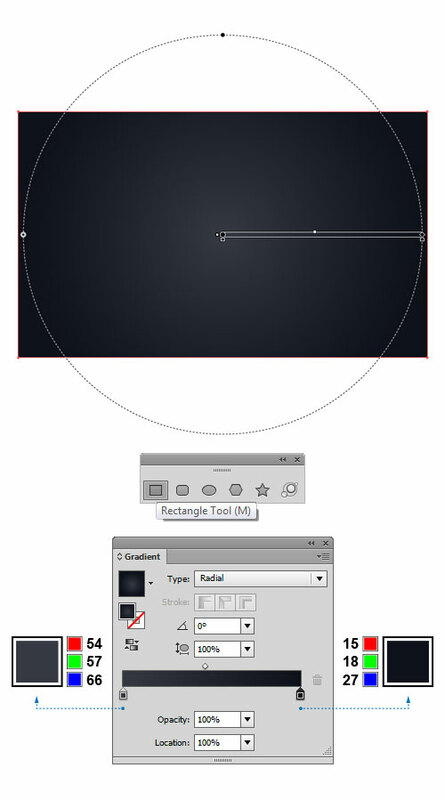 Create several different sized circles using the Ellipse Tool (L). Place the circles just above the objects created in the previous step. To fill the objects, pick the gradient colors similar to those used for the objects that lie beneath. Activate the Transparency Panel and change the Blending Mode to Color Dodge (Opacity 100%). Select all objects in the middle of the background, and rotate them by 45&deg. To constrain rotation to 45&deg increments, hold down the Shift key as you rotate. To complete the background, you can simply apply a clipping mask to mask out those unwanted shapes that extend beyond the artwork boundaries. That’s it. I hope you’ve enjoyed this tutorial.